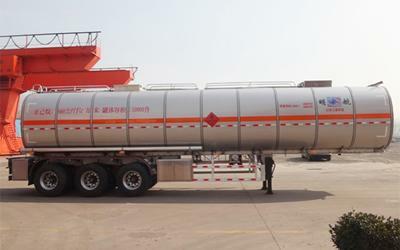 The Sanxing 30--60 CBM aluminum alloy chemical tank trailer is carefully designed to meet all of the strict requirements involved in the transportation and handling of various chemicals. We chose to manufacture these chemical tank trailers from aluminum due to the lightweight nature of the material. Aluminum trailers with the same volume as ordinary tankers are 4 to 6 tons lighter. The tank is also anti-static, which prevents sparking that can create extremely dangerous situation. The tanks are safe, lightweight, environmentally friendly, and can haul large loads. Main Beams Special design I beam, aluminum saddle support. Pneumatic Braking System 6 relay valve; T30/30+T30 Spring brake chamber; 45L air tanks. Other design and parts 1. Vapor recovery system. 3. Rear and side lights. 4. Rear Ladder to access the top of the tanker. 5. Aluminum Crown to whole length of Tank. 7. Tool Box 120cm (without tools). 8. Double spare tire carrier (winch type). 9. 2 No's of fire extinguisher holder. 1. The tank body is manufactured according to international plate quality standards using a 12 meter large plate rolling machine for molding. This creates a stronger and more durable finished tank. 2. The bulkhead is produced from 5mm thick corrugated steel plate for lightweight and high strength performance. The 1.2 meter anti-wave plate can minimize impacts during driving. 3. The two dished heads of the tank are manufactured using a plasma CNC cutting machine. They are formed using a dished end flanging machine that does not allow for manual percussion of the flange to avoid material damage. 4. The tank itself is constructed through an automatic gas-shielded welding process to ensure the quality of the tank weld. The tank will be welded only once with a one-piece formed longitudinal stringer that will optimize the strength of the tank structure. 5. Finished tanks are tested for gas tightness. If the gas pressure drops below 50Kpa, the tank will be deemed unqualified and the materials will be recycled. 6. The tank features internationally advanced technologies to enhance adhesion, uniformity, and durability in regards to paint. Following a thorough inspection, the tank will be sprayed with a polyurethane acrylic acid resistance paint in our spray painting workshop. The tank body will be placed in our hot air ring drying room to ensure a high strength and smooth paint coating. 7. Convenient pipeline layout and side protection net structure. The tank will also be thoroughly cleaned prior to delivery. 8. If a situation arises where the pressure within the tank is higher than the external pressure (6-8KPa) or lower than the external pressure (2-3KPA), the respiration valve will automatically open to normalize the pressure differential and ensure the safety of the tank and those near. When the pressure difference inside is within -2-6KPA the valve will be closed to ensure that there is no wasted contents due to oil evaporation. 9. In the case of an accident, the anti-overflow block in the respiratory valve will automatically seal in case the oil tanker tips. This will minimize the risk of oil leakage. 10.When the trailer is in high temperature environments, the pressure within will be automatically regulated in order to prevent the pressure from building to the point of explosion. When the working pressure inside the tank exceeds the external pressure of 21-32KPA, the emergency exhaust device will activate with a maximum displacement of 7000 cubic meters per hour. This will effectively prevent the danger of an explosion. Sanxing has been manufacturing heavy duty vehicles and special vehicles since 1994. Besides the aluminum alloy chemical tank trailer, we offer a wide range of fuel tank trailer, oil tank trailer, flatbed trailer, bulk cement tank trailer and so on. From the raw material selection to manufacturing process, we have rich experience and offer high quality chemical tank semi-trailers and other special transport vehicles with custom solutions.